It is February 1971. Four war photographers Larry Burrows, Henri Huet, Kent Potter and Keisaburo Shimamoto board a helicopter in Vietnam to make an aerial tour of the battlefront. Their flight should have lasted 10 minutes taking them from Firebase Hotel to Landing Zone Ranger South. Instead their helicopter lost its way and was shot down by enemy fire over Laos. All four photographers, together with the other occupants of the helicopter, were killed. The crash site remained undiscovered for 25 years. Horst Faas and Richard Pyle, both former Vietnam war photographers, never forgot their former friends and colleagues. Twenty-seven years after the crash they returned to Vietnam and joined a USA MIA search team excavating the hillside where the helicopter came down. 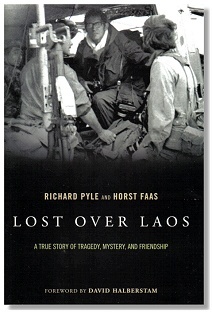 The book Lost over Laos tells the story of the crash and the efforts Faas and Pyle made to find the remains of the four photographers. Publisher - First published in 2003 by Da Capo Press. Horst Faas died on 10 May 2012 aged 79. This page was added on 07 February 2009. Updated on 17 March 2018.